What is Service Virtualization? How does it impact software testing Access, Behavior, Cost, and Speed? To achieve "quality @ speed", it's essential to have unrestrained access to a trustworthy and realistic test environment. It is important to recognize that a complete test environment includes the application under test (AUT) and all of its dependent components (e.g., APIs, 3rd-party services, databases, applications, and other endpoints). Moderately (or more) difficult to access for testing-for example, due to scheduling conflicts, access fees, geo-political boundaries, etc. For example, an internal service might be readily accessible from a staged test environment and simple to configure. On the other hand, a complex message queue is probably more difficult to stand-up in a staged test environment and considerably more challenging to configure for test. At the extreme end of the spectrum, a mainframe or ERP system will have multiple constraints associated with DevTest access as well as distinct limitations on your ability to configure it for test. Leveraging service virtualization ensures that a test environment is accessible on demand. It eliminates the access constraints and reduces the overhead associated with repeated configuration. Service virtualization also gives you control over the behavior of the dependent components. It is very difficult to alter the configuration of the network or hardware associated with each dependent component of the AUT. It's also quite common to face staged test environments that exhibit slower performance than you'd encounter in production. Using service virtualization, you can have greater control over how dependencies respond. This gives you on-demand access to a much broader range of dependency behaviors-just like a flight simulator. As a result, you can assess the risk of a release candidate faster and more accurately. Check how your AUT responds to performance variations in dependencies. Can users complete core transactions even when one dependency experiences high latency? 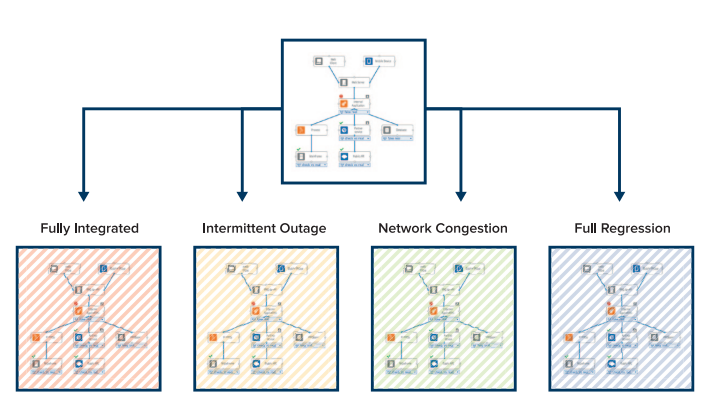 Do low-latency scenarios expose concurrency issues?